Have you tried this Power Scaling solution? Post your questions or comments! The Raw Bias Auxiliary Supply Kit is typically needed because the amp's original supply is not robust enough to support Power Scaling. Does your amp need RBX? See this article to check: When Do You Need RBX Raw Bias Auxiliary Supply? I've been looking at various V V F methods and the Power Scaling units. Can you shed some light on how they work please? I'm baffled on how they can alter just power tube voltage or can entire amp voltages. Would it not throw the bias voltages and everything else out of whack? The London Power site has a "Power Scaling Q&A" as well as detailed descriptions of the kits and selection guides "Selecting a Power Scaling Kit" and "About our Power Scaling Kits". London Power invented Power Scaling, so our method is the correct one to use if you want cranked amp sounds at Human Scale Loudness. It's not just hyperbole - it works! To maintain the sound of the amp you have to do two things: keep the speaker-amp interface intact, and maintain the transfer function of the amp. The first part is easy - just leave the speaker connected to the amp. This means that using a speaker attenuator is problematic as they interfere with how the speaker and amplifier interact. Everyone who has used an attenuator also knows that the tone changes quite a lot when you get down to useful loudness reductions. The second condition sounds complex but it is not. When Power Scaling (PS) is installed correctly the tone of the amp is maintained as you dial the controls down. The only thing you lose is that the aural compression of your own hearing is no longer being invoked to change your perception of the sound. Because the intent is to maintain the transfer function (input versus output), bias and other internal parameters are all addressed and taken care of. VVR is a bastardised copy and wrong implementation of a part of the Classic-PS circuit. 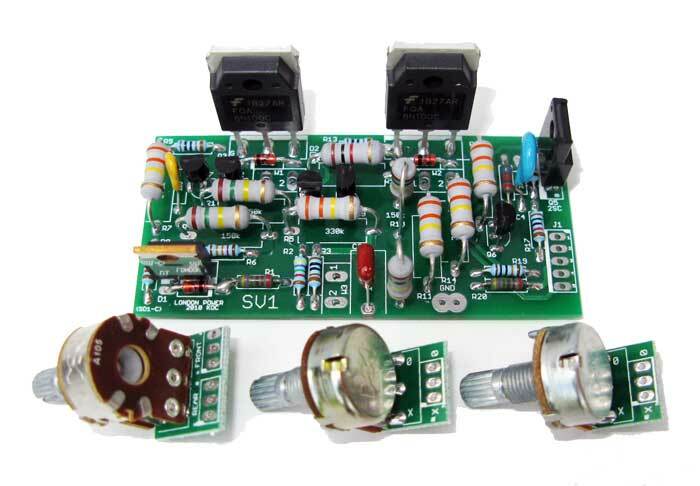 Dana Hall was asked by a licensed Power Scale amp builder to design a PCB, at which time Dana could see the entire implementation, yet his version can only be applied to small amps and cannot dial down to truly quiet levels. The crippled application also requires bandaids in the form of extra capacitors being added to the amp to keep controls from becoming scratchy - including the guitar volume pot! Marshall's EPA used in the YJ and Slash models is a form of PS-TT (two-thirds Power Scaling), but a poor implementation. Techs who have bypassed the EPA find the amp sounds like a Marshall again, and if they modify the EPA per our standards the amp remains Marshally-sounding but has useful power reduction. Victor Mason of Mojave Amps did not understand the circuit of the Power Scale kit he bought, and copied the Mesa Limit control depicted in TUT. He used our Power Scale ad copy to describe what his control would do - which it does not - and stated "Kevin O'Connor likes complicated circuits". That is not true. A circuit must be as Einstein describes, "Simple enough to do the job properly and no simpler". Power Scaling does what we say it does and the alternatives simply do not. As our books TUT2, TUT4 and TUT6 show, there are a wide variety of circuits that can be used to implement Power Scaling, each with its own benefits and cost. (10-31-2018, 01:05 AM)Jollyjoe Wrote: I've been looking at various V V F methods and the Power Scaling units. While it may seem like voodoo once you read TUT4 and TUT6 you'll be amazed at how logical and simple the implementation can be. I too was puzzled until I bought the books. I've found out most of the forum based opinions and concerns stem from not understanding how it works. Altering/controlling voltage is really quite simple---it's just not usually done in tube amps. All the areas of concern about implementation and tone are addressed and often multiple solutions are presented. If you want really technical explanation it's worth every penny plus the other chapters are gold mines too. If you are not wanting to get that involved the most important thing is that it works and works really well! Get a London Power Kit...it will have good instructions and technical support if you need it. Bio: I am an amp repairer, modifier, builder, guitar player, married to a musician and father of two. I have read TUT, TUT2, TUT3 and TUT5, POP many, many times over and just ordered TUT4. Successfully installed bias + SV1 SV2 power scaling kits. Ham radio operator (DXer) and engineer. I installed both in my Fender Hot Rod Deluxe in 2016. The SV1 board fit at back, right corner of the chassis after removing the external speaker jack and zip tieing the fuse holder to internal power wires. A heat sink is on the outside. RBX is on the back and a sag 100R under the PCB. The harmonica player in our band owns this now. Sold to him to make some room and finance my first attempt at "thunderous smooth". Runs JJ 6V6s. I include the pics in case anyone else wants to give this a try. There are so many of these amps for sale used and broken for great prices. The SV1 and RBX difference / results are just amazing. I now plan to sharpie "PS at max" inside next to the bias pot. PS and comp pots are under the lamp on top.